Publications on an international level and addressing prison chaplaincy from different angles are rare. 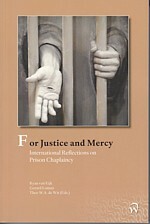 For Justice and Mercy offers international texts on the position of prison chaplaincy and examples from the praxis. The initiative for this publication was taken by the board of ICCPPC to pay extra attention to its 65 years existence, and to the Year of Mercy 2016.